This home was remodeled for seasonal rentals to provide open areas for multiple family members to enjoy. This beautiful well maintained lakefront home with a large double boat dock is within five minutes from the town of Lake Ozark and Osage Beach. This comfortable home was designed for multi-family gatherings bringing together parents, siblings, grandparents, cousins, aunts, uncles, good friends to make lasting memories. Whether it's relaxing, fishing, swimming, golfing, boating, shopping, or just enjoying time with family/friends, this 3,000 sq. ft. home will make this one of your favorite vacations! Spread out and relax in this two story home with new appliances and leather furniture throughout. Enjoy the outdoors on the patio, decks, and dock with some provided swim toys, 2 paddle boats, 3 adult kayaks, and 2 child kayaks. Or take in the beautiful view through the enclosed porches and wall of glass while enjoying the indoors. Enjoy waking up to a spectacular sunrise over the lake on one of the many decks or patio. The upper floor of this home contains 4 of the 5 bedrooms and 3 of the 4 bathrooms. The large master bedroom has a king size bed, master bath, a fireplace, flat panel TV, and 2 sofa beds (one on the enclosed upper deck accessed from the master bedroom). The second and third bedrooms share a hallway bath and both have queen beds. The fourth bedroom has been designed especially for kids with its own bathroom, three sets of bunk beds, (3 twin beds, 1 full size futon, and 2 small 5' child beds), and flat panel TV / DVD. The fifth bedroom is located on the lower level, perfect for senior family members who would rather avoid the stairs yet have full access to the main living areas. This bedroom has a queen bed and a flat panel TV. With a convenient bathroom right next door that contains a walk-in shower and laundry facilities. Also on the lower level is the well equipped kitchen with 2 refrigerators, large dining room, fireplace, comfortable living room with large flat panel TV / DVD. Another sofa sleeper is in the living room. Just off of the living room is the enclosed porch where vacationers can enjoy the view. The garage functions as a game room with a Foosball table, ping-pong table, card table, etc. A fire pit, with free wood, is available for those cooler evenings in the spring and fall. 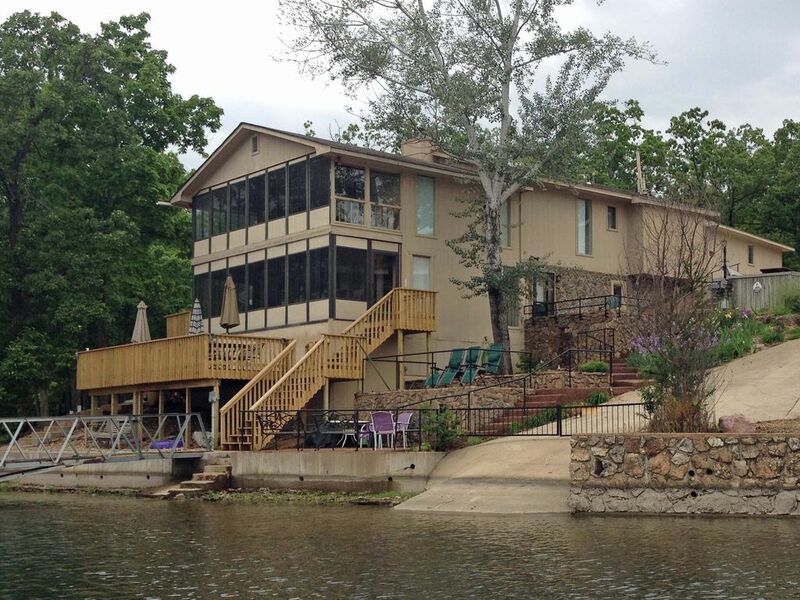 This home is located in the no wake part of the 1 mile cove at the Lake of the Ozarks. In addition to plenty of parking, a boat ramp across the cove, the home is just 3 miles from the town of Lake Ozark so very convenient to shopping, restaurants, grocery, spa, golf, and activities like miniature golf, go carts, and a helicopter ride around the lake. Also in the cove is boat rental and within 5 miles by land or 1 mile by water are rentals of personal watercraft. Boat docks have new electric which meets the most recent code and has a certified permit. Just can't beat this location! This rental is for multi-family get together ONLY - NOT a party house for bunch of adults so please save your time and mine by looking elsewhere if you don't meet this specification. I have added a lot of amenities for family enjoyment and intend to keep this house nice for families. Respectful friend groups and golfers are welcome. I've enjoyed living at the Lake of the Ozarks for many years. Could not ask for a better location or a more enjoyable place to vacation! I keep the house and property updated and in top shape. Many extras have been added to make it great for families such as: for the older family members an easy to grasp hand rails were added to the top of the deck railings going down the steps; for big family dining outside the outside deck was enlarged to accommodate 3 sets of tables/chairs plus gates were made to keep the toddlers in; for family fun water toys and a well equipped game room is provided; and a very nice 4 burner gas grill for large family grilling. Safety is always at the forefront as a property owner so the house includes smoke alarms, fire extinguisher, weather alert radio, life jackets in various sizes, and new dock electric that has been fully inspected and deemed safe and up to code. This property goes the extra mile for guests. "Our families could not have chosen a better place for our 1st family vacation. 16 of us were spread out between the dock, water, house, game room all week. The 'Perfect Setup; for a large group." Two air conditioners cool the house very well. Sheets provided. Bedspreads are washed after each rental. "Can't imagine a nicer place to bring our families for a wonderful relaxing vacation." There are usually basic pantry items left from previous renters - salt, pepper, sugar, baking soda, baking powder, corn starch... Not provided by owner. "Thanks for stocking the kitchen so well. The house is lovely and very clean." The garage is the game room. It is not air conditioned but the doors and windows can be open to allow the breeze in. "This was a fabulous house with more than we would had ever expected. We came with the intent to do so many things locally but never felt the need to stray from the house and lake! Too many memories to write - but never to forget! Great property. Would definitely recommend. Everything for a great vacation is provided for you! This vacation home had many amenities, comfortable seating for large gatherings, both inside and out, fully stocked with kitchen appliances, towels and linens. We had 14 young and older adults and there was something for everyone. We plan to come back. Perfect place for a family vacation! This vacation home more than exceeded our expectations! There were 18 of us (10 kids) and we had plenty of room! The 4 bathrooms were great! The large kitchen table was perfect so we could all eat together. Loved having 2 refrigerators! We spent most of the time on the large dock! Everyone especially the kids enjoyed the kayaks, paddle boats and the slide! This home is very nice and also very clean! Had a wonderful vacation! We will be back! We had a family reunion comprised of 4 individual families and grandpa. The space worked really well with plenty of room, privacy and space to hang out together. The kitchen had everything we needed to make meals and dine together. There is an abundance of outside areas to congregate and a lot of toys to keep the kids (and adults) occupied. We had no complaints! Wonderful home with all the amenities and room to gather together. The dock was amazing...the slide, kayaks, paddleboards. Went kayaking in the quiet cove and saw fish, turtles, a deer and golfers all at the same time. Would definitely recommend and would come again! We had 10 Adults and 2 kids. Plenty of beds and space for everyone. Loved the two fridges in the kitchen. Great fishing, lots of water toys for adults and kids. The game room was a hit with ping pong competitions. Life jackets of every size to use. Golf, Boat Rental, Bagnell Dam and grocery store all very close.